Mustafa Kemal Atatürk.. A Brief Presentation in English..
Cumhuriyetimizin kurucusu, büyük kurtarıcımız Gazi Mustafa Kemal ATATÜRK hakında kısa bir İngilizce tanıtım yazısını sitemize koymamızı hoş göreceğinizi hatta yararlı bulacağınızı umarız..
Herkes okusun ve o büyük insanı ve eylemini yakından tanısın..
Daha çok insan okusun.. Öğretisi KEMALİZM tüm insanlığa ışık olsun..
Mustafa Kemal was born in Salonika in 1881 and began his military career as an Ottoman Army cadet, studying at the Harbiye military college in Istanbul from 1899 until 1905. His initial service was with a cavalry regiment in Syria. During this period he joined the reformist Motherland and Liberty secret society in opposition to Sultan Abd al Hamid II. Although he believed in the separation of the military from politics, Kemal was a member of the Committee of Union and Progress and played a role in the ‘Young Turk’ Revolution that ended the sultan’s absolutist rule and restored parliament. Kemal served with distinction in Tripolitania (Libya) during the Italo-Turkish War (1911-12), repelling the Italians at Tobruk and successfully defending Derna despite being wounded in an air raid. During the Balkan Wars (1912-13), he took part in the Turkish amphibious landing in Thrace and the capture of Erdine from the Bulgarians. In 1913 he was made Ottoman military attaché to all Balkan states and promoted to colonel. Despite opposing Ottoman involvement in the First World War, once it had started he threw himself wholeheartedly into the conflict. During the Dardanelles campaign Kemal commanded the 19th Division before being made chief of staff of the 5th Army. He displayed great leadership and tactical acumen, reacting immediately to the Allied landing at Anzac Cove in April 1915. He launched successful counter-attacks against the Australians and New Zealanders as they attempted to take the high ground surrounding the landing areas. By nightfall on 25 April they had suffered over 2,000 casualties and remained stuck on the beaches. Following these triumphs, Kemal was sent to command XVI Corps on the eastern Anatolian front. In August 1916 he launched a successful counter-offensive against the Russians, capturing Bitlis and Mus. When the Russian Army of the Caucasus collapsed during the Revolution of 1917, Kemal was transferred to Palestine. He was given command of the 7th Army, but following the loss of Baghdad, he became increasingly fearful that the war was lost. He also expressed anger at a government that was unable to supply his men with adequate weapons and supplies, and resented the transfer of supreme command from Turkish generals to the German Erich von Falkenhayn and Otto Liman von Sanders. 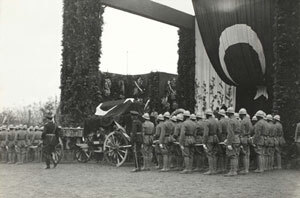 After resigning his command in protest he accompanied the Crown Prince to Germany, visiting the Western Front and concluding that the Central Powers were defeated. Restored to his command by the new sultan, Mehed VI, he ended the war in Aleppo after his army was forced to retreat following the Battle of Megiddo. With the Ottoman capital occupied by the Allies, most of the Balkans gone and Turkey bereft of its Arab provinces, Kemal felt a personal duty to fight for the integrity of the remaining Turkish heartland of Anatolia. Posted in 1919 as inspector general of the army in northern Anatolia, he quickly started to act independently, resigning from the Ottoman Army and helping to arouse nationalist feeling in the aftermath of the Greek landing at Smyrna. The First Great National Assembly at Ankara, now a rival power bloc to the Ottoman government in Istanbul, gathered in spring 1920 with Kemal as speaker. It later elected him president. In 1921 the Greeks advanced from Smyrna, but were held before Ankara at the Battle of Sakarya in August-September. Following this success, Kemal was made commander-in-chief with the rank of marshal. He went on the offensive the following year, capturing Smyrna in September and forcing the Greeks to evacuate Anatolia. A skilled statesmen as well as a great soldier, at the subsequent Treaty of Lausanne (1923) Kemal was given a Turkey in Anatolia free of foreign troops and full control of the straits. 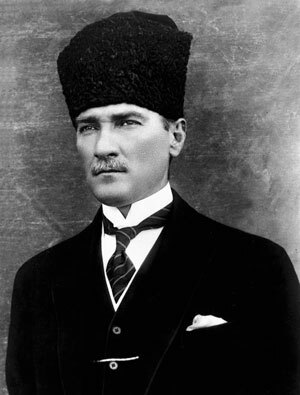 Anger at the weakness and defeatism of the sultan in Istanbul led him to work for the abolition of the sultanate in 1922, the proclamation of a republic in 1923, and the abolition of the caliphate in 1924. As ‘Atatürk’ (Father of the Turkish Nation), Kemal steered Turkey through a period of turmoil, but it emerged as a modern secular state, with a neutral foreign policy, planned economy, westernised education system and a strong army. Önceki Önceki yazı: Bedri Baykam : Silivri Zindanı, İnsanlık Adına Tarihe Gömülecek! Sonraki Sonraki yazı: Prof. Dr. Hilmioğlu’nun oğlu yaşamını yitirdi..